Click photo above to see a larger, tastier photo. 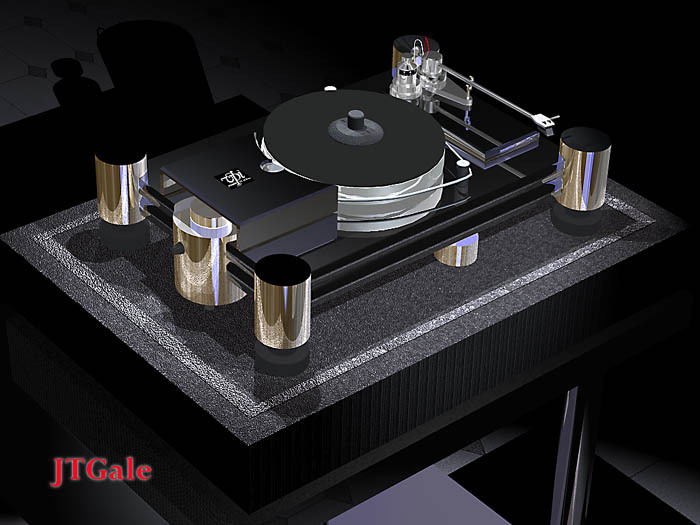 Above is a killer cool 3D rendering of the VPI TNT turntable done by Jon Gale. This cool dude does lottsa 3D rendering of audio gear as well as rooms. He's got more stuff on his killer web site. Hey, why not check it out while you're surfin' the 'net. Micro Seiki... Many folks i know love their tables and i can see why! 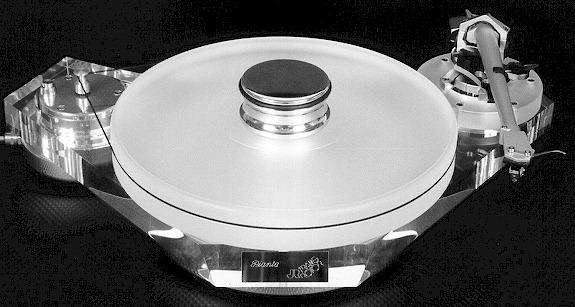 In it's ultimate form, the RX-1500FVG as shown here uses an air bearing that floats the heavy platter .03mm over the base for ease of platter rotation without mechanical friction in the direction of thrust. 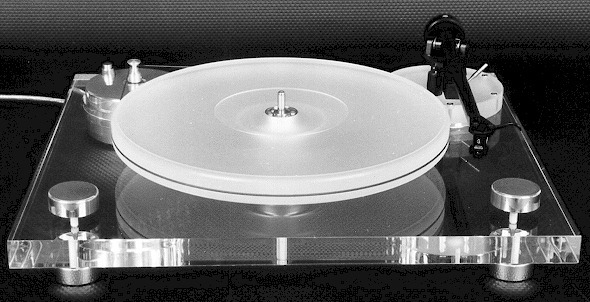 A vacuum suction system secures the vinyl record to the platter while the quadruplex suspension system uses coil springs, rubber diaphragm pistons, compressed air, and high viscosity oil to reduce any acoustic feedback from reaching the delicate tracking of the needle. 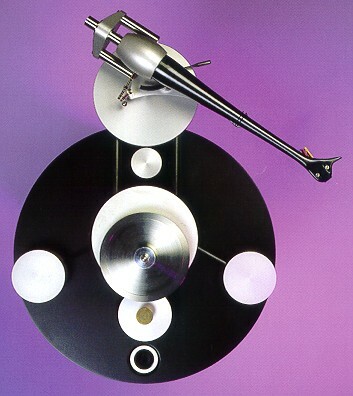 Shown here, by the way, with two tonearms which are not included. 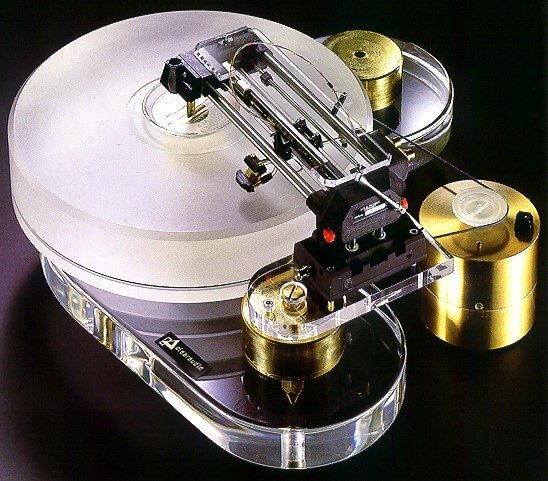 Since 1979, Oracle Audio Technologies has been famous for their hand-crafted Delphi turntables. Well, here's the newest MK-V version. Each suspension tower uses no less then twelve different components while the massive eight pound platter keeps the vinyl nice and flat with the aid of the new center clamp. The new bearing replaces the traditional two bushing system with six nylon precision surfaced setscrews. The new Turbo Power Supply has been redesigned to achieve very high performance! Oracle continues to be the "Fine Art of Playing Music." Ya know, one of my close friends uses this turntable and he has the most awesome music collection i've ever seen (hi Douglas!). What you see above in the VPI TNT turntable that is used by a few reviewer friends of mine too. Oh heck, let's forget the description and just enjoy the larger, tastier picture. After all, there's just not enough room here to suffice a really good description in my humble opinion. 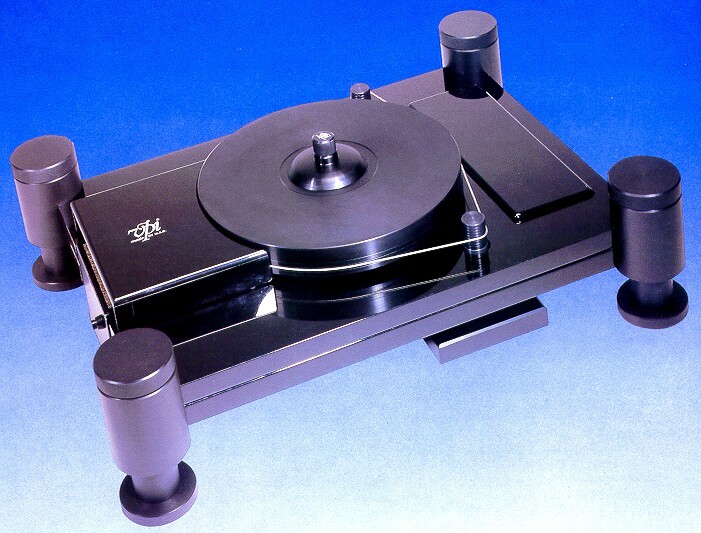 Here's the famous VPI JMW Memorial tonearm. Many years of research and development has been used to make this a fave with a few friends of mine. 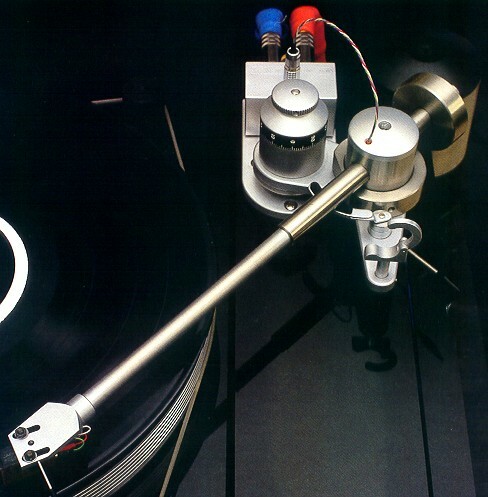 This tonearm was named after Sheila and Harry Weisfeld's son, Jonathan, who passed away in 1995. The VTA can be adjusted in .00035" graduations! They claim no antiskate is needed due to the low offset angle of the headshell and the needed antiskate is provided for by the tension of the leadout wires. 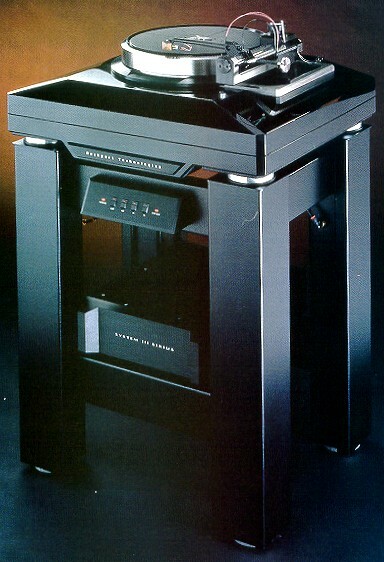 The Rockport Technologies System III Sirius is a fully implemented separate turntable, stand, motor control, and power supply (please see larger, tastier picture). Via the push button control below the turntable you can control the speed. A linear tracking arm is shown here which is precision designed to give what they feel is the ultimate of music reproduction qualities. The power supply to this unit (bottom part of the larger photo) is big, bad, and oh so good. Kinda reminds me of the Goldmund Reference turntable in some respects. 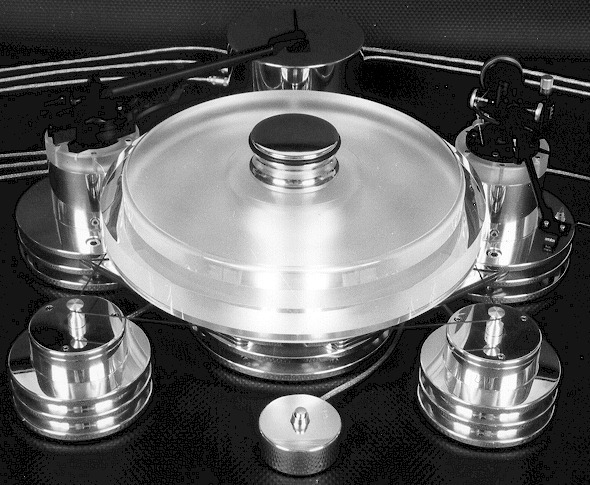 The Wilson Benesch Circle turntable is a low mass design (unlike the Walker below). They seem to love uni directional carbon fibre and like the Walker use very high precision parts. Shown here without the platter it truly looks like a work of art! Shown here with the Wilson Benesch ACT 0.5 tonearm shown is a beautiful sight. 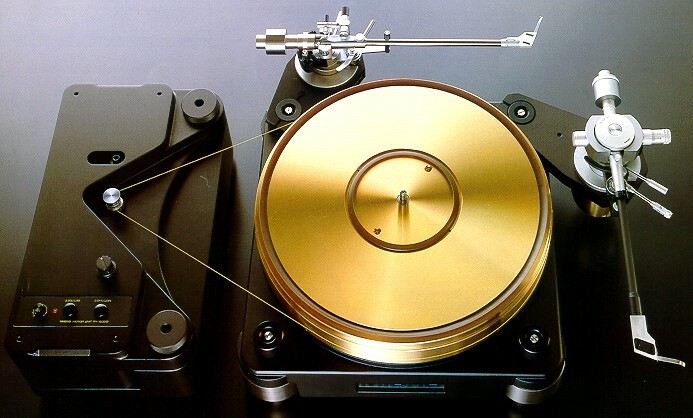 Here's the Walker Audio Proscenium Gold Signature Turntable. Featuring a cast from marble and lead base/table supported by a six piece Valid Points Resonance Control System. An air bearing platter is ten inches in diameter with three air jets. The platter itself weighs in at 70 lbs (the entire system is about 245 lbs.!). This turntable includes the tonearm which has a 45psi air bearing containing eight air jets. There's more, yet the larger, tastier pictures shows you whole system. Hey, why not take a look and see for yourself? 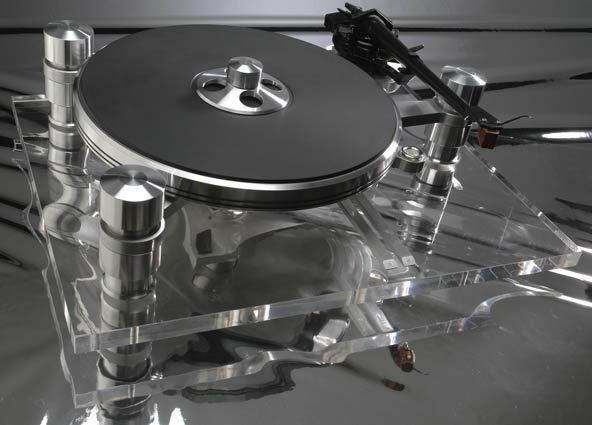 One of the most beautiful tables now available, in my humble opinion, is the Clearaudio Reference Table with the Souther TQ-I tangential tracking tonearm. The use of geometrical shapes helps dampen the vibration which could detrimentally effect the music it reproduces. The nice round platter starts it's life as a solid block of acrylic and is precisely shaped into what you see above. An inverted bearing is used while the tonearm uses a short titanium tube. Like Little Red Ridinghood said "My, what a long tonearm you have." The better to play 20" transcription discs my dear. The Simon Yorke Designs dual tonearm turntable can play records upwards of 20" in diameter. It features the 9" and the 12" unipivit tonearms too! This is a professional archive turntable designed and hand-crafted for the Federal Government of the United States of America and used the the National Library of Congress in Washington D.C.
---> Back to main lust pages.